The team at tpmbLAW is pleased to offer a range of legal services to meet the needs of corporations, business and individuals. Listed below are several of the most active areas of our legal practice. 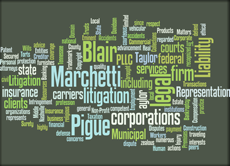 The attorneys of Taylor, Pigue, Marchetti & Blair, PLLC have successfully represented business and individual clients in matters for decades with an emphasis on defense of claims. We help our clients with legal issues relating to litigation, insurance claims, insurance coverage, general liability, property damage, personal injury, product liability, subrogation and many other types of legal challenges and risk management. Our experience helps us excel in the often complex litigation required to provide our clients with a positive result. Our team of knowledgeable and effective litigators provide civil and criminal defense representation to individuals, businesses, not-for-profit entities, and municipalities. We are experienced in matters involving wrongful death, labor and employment law, commercial litigation, regulatory compliance and governmental investigations, land use and eminent domain, and representation of not-for-profit entities, including religious organizations and schools. We take a thorough and legally insightful route to resolving even the most difficult cases. When we represent our clients, our primary goal is to produce the best long-term outcome in resolving their legal matters and present their strongest defense possible in court. We’re well-versed, dedicated and experienced when it comes to creditors' rights, representing secured and unsecured creditors, preference litigation, and other creditor-related adversary proceedings. We handle suits for accounting, turnover, and motions involving cash collateral, and relief from stay. Members of our practice regularly work with a wide range of bankruptcy and non-bankruptcy issues such as assignments for the benefit of creditors, issues arising under the Fair Credit Reporting Act, the Fair Debt Collection Practices Act, and the Uniform Commercial Code. We also assist our clients in recovering value from debtors due to judicial and non-judicial foreclosures on real estate.